Protecting your business is fundamental. And one of the biggest mistakes businesses make on social media is that they fail to listen. Whether a customer complaint, or gathering intelligence, monitoring and listening are essential. Yet, it is not something all businesses do or do well. Regardless of whether your business uses social media or not, one of the dangers is the multiple exchanges that are occurring. These are constant, instant and challenging. As Quentin Aisbett from the digital agency OnQ marketing says, “Conversations around your business are happening online. They could be on Facebook or Twitter, via a personal blog or posted in a forum.” Quentin provided many insights for businesses and was very generous with his time when I interviewed him for The Business of Being Social. 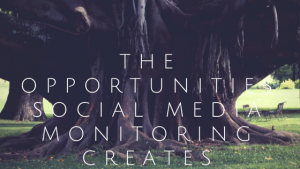 There are plenty of software tools that can help to monitor the conversations occurring on social media and which make it just about effortless for business. Listening is a valuable tool to use and here are 3 reasons why business needs to monitor what happens on social media. The millions of interactions occurring on social media produce vast amounts of content. These conservations can be about your company but also about your competitors, clients or potential clients. Tapping into this content is a gold mine full of riches and insights which can be utilised to the advantage of the business accessing the data. Not only does monitoring help to protect your brand, it can actually assist to improve it. If you are not monitoring these conversations, how do you know what is being said? Listening can provide feedback that no focus group can deliver. This information can be used to satisfy an irate customer but also to manage what is being said; and importantly to correct any inaccuracies which are bound to occur when so many people are sharing their experiences. Companies like to believe that they are customer-focused on social media. Most of the time they are not with some businesses posting content just for PR or marketing, ignoring the engagement element social platforms provide. Taking the time to listen to what people are saying, trends can be established which can assist to improve customer service and experience but also to provide ideas about possible future services or products.